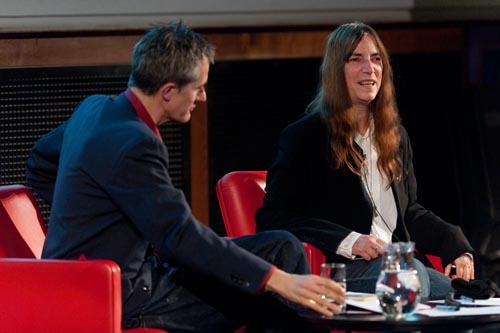 Patti Smith is still dreaming – this time about her next novel, for her life has taken a more literary turn since her seventies heyday as the ‘grandmother of punk’. In an interview with Geoff Dyer at the Royal Geographical Society last week, she says: “I saw the whole book in this dream. 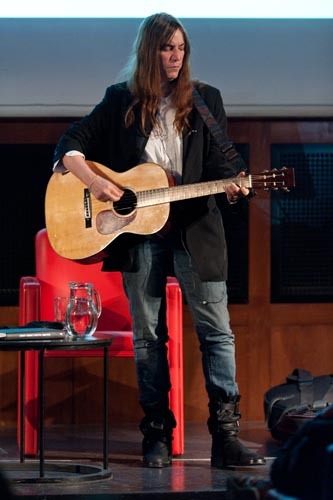 I saw each chapter heading, each picture.” Later, she talks of William Blake, the Romantic visionary poet and engraver; and, at the suggestion of a member of the audience, picks up her guitar and finishes the evening by singing in her smoky, gravelly voice My Blakean Year. Like Blake, the spiritual and the subconscious play a big role in the creation of her work. Most people still only know Smith as a musician, despite the fact that she is also a visual artist and writer. About her music, she is modest – even disparaging: “Growing up in Jersey in the ’50s and ’60s, everybody sang. Most of my friends were better singers . . . I can’t speak about myself in musical terms: it was all performance for me.” She reveals that, at school, she was often called upon to sing the tenor parts in Verdi because of her low voice. Heading to New York in 1967, she initially set out to be a poet – and one gets the sense that it is as a writer that she would most like to be remembered. At the moment, she’s working on a detective novel which was inspired by a visit to St Giles in the Fields, just off Charing Cross Road. It is, she says, “68% complete”, and she returns to St Giles each time she visits London to sit in exactly the same spot she occupied when the idea came to her. Inspiration has an almost holy quality for Smith, a true latter day Romantic. Right now, she’s in London not so much to research the detective novel as to promote her new memoir, Just Kids, which came out last year, winning the National Book Award; it is an autobiographical account of her relationship with the photographer and artist Robert Mapplethorpe, and a fascinating portrait of the lifelong friendship of two of Art’s greatest dreamers, written at the behest of Mapplethorpe himself as he lay on his deathbed. Smith’s style is refreshing in her apparent candour as she chats directly to the audience during the interview. 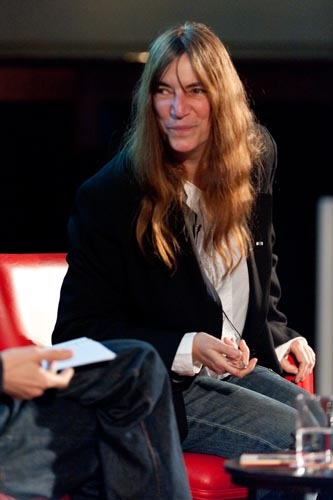 She mentions that she has been accused of ‘name-dropping’ in Just Kids and, certainly, her conversation is peppered with references to Ginsberg (“Allen”), Burroughs, the Clash, Warhol, Dylan, Jim Morrison – but, she says, this is because they “were all there”; living in Manhattan’s Chelsea Hotel in the 1970s, she could hardly avoid famous associations for it was where anyone who was anyone hung out and, she says, the distance between the famous and the ordinary citizen was far less. “It wasn’t like today with the paparazzi,” she says – though, even then, “you didn’t just run up to them”. There’s a sense that she laments this bygone age. Smith has a profound connection not only to her dreams but to the past: “I love the past, I embrace the past, I herald the past”, she says at one point – this in reference to Victor Bockris’s biography. There is ill-feeling between Smith and Bockris who, she feels, wrote “a poor book . . . it’s a terrible book.” What irks her is that “there are things he wrote against my own children”, and she believes that many of the people he encountered in his research for the book didn’t like her. She is similarly troubled by Patricia Morrisoe’s biography of Mapplethorpe: “she twisted everything . . . she didn’t like us, didn’t like our lifestyle.” The inability to control how she is seen upsets Smith. Several times she puts her interviewer right about facts he’s gleaned in the course of his research, wondering aloud in frustration “where all these stories come from”. But then, self-deprecating, she relates an anecdote about Johnny Lydon who, having seen Smith play, asked a companion the next day, “Did you see that hippy banging her tambourine last night?” – despite the fact that Smith vows she has never played a tambourine in her entire life. Later, she seems keen not to appear bitter: “I do what I do. I don’t do anything to refute other people”. Smith is a good raconteur, humorous in her stories about herself and her past, yet also ardent about her work. She has a real rapport with the audience who, though there is a handful of young Patti Smith clones with thick fringes and tomboyish figures, also includes, I suspect, many Intelligence Squared regulars. The Royal Geographical Society seems, initially, an unusual place to host this interview: the oak panelled hall lined with the gilt-painted names of famous explorers is at odds with an informally clad Smith in jeans and an oversized black jacket – but someone makes the point that the artist is also a pioneer, a pioneer of ideas, and so she has every right to be there. Long may Smith then continue to travel and explore. Thanks to Intelligence Squared for stumping up tickets for our competition winner, Will Peach!